SPONSORSHIP: Corporations, businesses and organizations can order from our collection of proprietary HUGS and give them away to groups, hospitals, Churches, communities, Toys For Tots, Make a Wish, St. Judes, 3rd World countries or impoverished lands. Devastated regions where all is lost from storms or disasters. Every One Needs a HUG. Just imagine putting a smile on someone's face with LOTS OF HUGS from (your corporate name) emblazoned across the chest or paw. Make a difference in this World by giving someone a HUG! A gift from the Aktion Clubs of the Carolinas. PRIVATE LABEL: Lots Of Hugs can develop private label Hugs and other proprietary products for your business for retail, charitable or fund raising purposes. 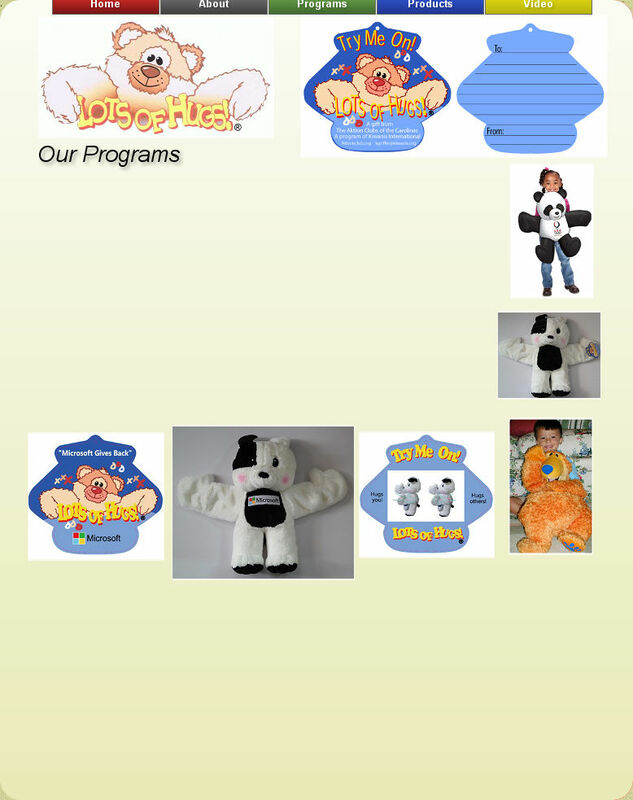 Contact us to discuss your logo or special likeness made into a HUG. Perhaps it’s the Campbell's kids or the Coca-Cola polar bear or maybe Ronald McDonald himself. The possibilities are endless. Our factories are ready to serve your needs. Make a difference in this World by giving someone a HUG! COMING SOON! Send a Hug to someone you love. Child or Adult. This will allow you to place an order for a special HUG to be sent to your special someone. You will be able to order on line or through our 800 number. Give the HUG that keeps on HUGGING!